The United States fought the American Revolution primarily over King George III's Currency act, which forced the colonists to conduct their business only using printed bank notes borrowed from the Bank of England at interest. After the revolution, the new United States adopted a radically different economic system in which the government issued its own value-based money, so that private banks like the Bank of England were not siphoning off the wealth of the people through interest-bearing bank notes. But bankers are nothing if not dedicated to their schemes to acquire your wealth, and know full well how easy it is to corrupt a nation's leaders. 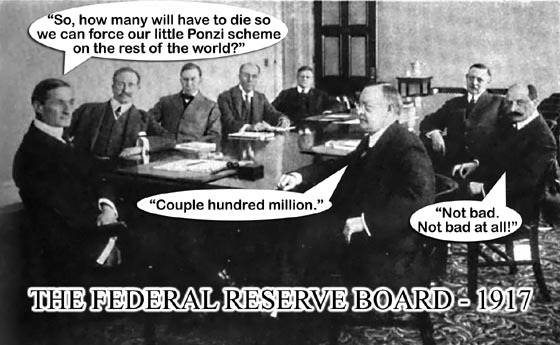 Just one year after Mayer Amschel Rothschild had uttered his infamous "Let me issue and control a nation's money and I care not who makes the laws", the bankers succeeded in setting up a new Private Central Bank called the First Bank of the United States, largely through the efforts of the Rothschild's chief US supporter,Alexander Hamilton. Founded in 1791, by the end of its twenty year charter the First Bank of the United States had almost ruined the nation's economy, while enriching the bankers. Congress refused to renew the charter and signaled their intention to go back to a state issued value based currency on which the people paid no interest at all to any banker. This resulted in a threat from Nathan Mayer Rothschild against the US Government, "Either the application for renewal of the charter is granted, or the United States will find itself involved in a most disastrous war." Congress still refused to renew the charter for the First Bank of the United States, whereupon Nathan Mayer Rothschild railed, "Teach those impudent Americans a lesson! Bring them back to colonial status!" The British Prime Minister at the time, Spencer Perceval was adamently opposed to war with the United States, primarily because the majority of England's military might was occupied with the ongoing Napoleonic wars. Spencer Perceval was concerned that Britain might not prevail in a new American war, a concern shared by many in the British government. Then, Spencer Perceval was assassinated (the only British Prime Minister to be assassinated in office) and replaced by Robert Banks Jenkinson, the 2nd Earl of Liverpool, who was fully supportive of a war to recapture the colonies. Financed at virtually no interest by the Rothschild controlled Bank of England, Britain then provoked the war of 1812 to recolonize the United States and force them back into the slavery of the Bank of England, or to plunge the United States into so much debt they would be forced to accept a new private central bank. And the plan worked. Even though the War of 1812 was won by the United States, Congress was forced to grant a new charter for yet another private bank issuing the public currency as loans at interest, the Second Bank of the United States. Once again, private bankers were in control of the nation's money supply and cared not who made the laws or how many British and American soldiers had to die for it. Once again the nation was plunged into debt, unemployment, and poverty by the predations of the private central bank, and in 1832 Andrew Jackson successfully campaigned for his second term as President under the slogan, "Jackson And No Bank!" True to his word, Jackson succeeds in blocking the renewal of the charter for the Second Bank of the United States. Shortly after President Jackson (the only American President to actually pay off the National Debt) ended the Second Bank of the United States, there was an attempted assassination which failed when both pistols used by the assassin, Richard Lawrence, failed to fire. Lawrence later said that with Jackson dead, "Money would be more plenty." Video version of "All Wars Are Bankers' Wars"